Right now, there’s a bot on Twitch playing through Pokémon Red. Its goal? To try to beat the current human world record for playing through Pokémon Red as fast as possible, without the use of any glitches. 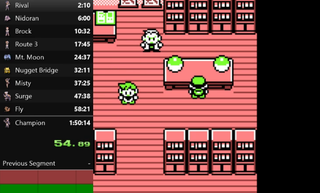 That record is currently held by Pokémon player Exarion, who has sped through Red in 1 hour and 49 minuteson the Game Boy Color. The closest the bot has come to beating that record is a time of 1:50:14—but it’s still trying. Behold: ThePokeBot. According to the Twitch page of The Poke Bot, the bot watches the game in real time—that’s how it decides what to do. It does this by using the game’s RAM, which tells the bot what is happening at any given moment. The robot has been designed to try to take risks, many of which can throw the run off—but it’s all in the name of trying to get a faster time. Thing is, humans who run Pokémon Red feel that they’ve done most of what they can do with the game in terms of optimization. “Pretty much all that’s left is to grind out runs to get ideal RNG (luck),” the Twitch page says. Enter ThePokeBot. Fascinating, right? The robot is trying to do what humans can’t, in a way that humans wouldn’t. In certain situations, humans might feel fear, which leads to playing more conservatively in the hopes of not losing it all. This bot can’t care about that. It only cares about getting a good time. Couple this with a a mechanic that the game has, where having your health dip far enough makes the game run faster, and The Poke Bot is actually pretty entertaining to watch, even if it does end up resetting a whole lot. “[The Poke Bot] plays as humanly as possible, only using information that you can see on screen or by memorizing information that doesn’t change between runs (like the stats of enemy Pokemon),” the Twitch page says. You can read more about the strategies this bot uses here, or follow it on Twitter here—the bot doesn’t always run, so that’s a good way of keeping up with when the stream is live.